I need to make some space in my greenhouse, since I've brought everything in for the cooler months. These are some seedlings Iv'e been growing as an experiment . Will trade for Myrtaceae that I don't already have, Passiflora cuttings, and maybe other fruit tree cuttings. 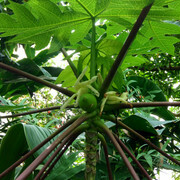 Tropical Fruit Discussion / Passifloras suited for a drier climate? I would like some suggestions of Passiflora species for a dry/not very humid, yet warm climate. I keep most of my plants in a heated greenhouse that stays anywhere between the low 60s and mid 90s year round. (Depending on the weather outside.) I have species growing vigorously, but I am concerned to if they will flower or fruit eventually. I have some growing on trellises attached to a wall, but plan to have some grow on a home-made "Spiraclimb" using garden wire and a stake so the plant can be wrapped around as an endless bush-vine. Maybe some of our California or Arizona growers could give a clue? Hi all! I planted a number of Passiflora species a year+ back. Some seeds I gave up on, and they eventually germinated. Now I don't know what they are! It isn't as vigorous as my P. edulis seedlings and the leaves are not lobed, and I don't think they will be. I have not paid much attention to it, so it has some deficiencies. I have planted: laurifolia, maliformis, alata, ambigua, and ligularis. I kind of think it might be P. maliformis, but I'd like some other opinions! Stems vary from green to reddish. Tropical Fruit Discussion / Wampee vs Pink Wampee Taste? Has anyone tried both Clausena lansium (wampee) and Clausena excavata (pink wampee)? I'd like to propagate one or both species, but was wondering of one is preferred over the other. From what I've read, it looks like a worthy yet underrated fruit. If anyone has suggeestions/growing tips, please post them! I am looking for mature cuttings of multiple Passiflora species: laurifolia, edulis, ligularis, alata, any other edible Passiflora. I have for trade: Malay apple seedlings 7", maprang seedlings 7", Passiflora maliformis seeds, poha berry seeds, plants, and cuttings, germinated loquat seeds, mamoncillo seeds, germinated santol seeds, and gin berry seedlings. I also have an ice cream bean tree that hasn't fruited yet, but I can give cuttings of, and cuttings of hibiscus, bougainvillea, and jasmine. I can buy as well. I recently bought golden kiwi fruits. The fruits are from NZ and have a deep yellow flesh with very little fuzz. The flavor is a nice balance of sweet and tart. I have over 200 seeds available and I am willing to sell or trade. Since I do not commonly see cuttings and plants of this variety, I thought I may be appropriate to offer seeds. $6 (includes shipping) for 20 seeds. Jungle Jim's is an international market that I frequently visit in search of fruits I have not tried yet. It is one of the few affordable opportunities I can get to try tropical fruits up north. Many of the fruits are totally overpriced and some are not of best quality, but I can't help but buy some and of course take photos! Fruits that are also there on occasion: Lychee, rambutan, longan, soursop, groundcherry, purple muscadine, concord grape, Francine and atalufo mangos, sour oranges, seasonal apples, Rainier cherries, carambola, tamarillo, white pitaya, ugli fruit, blood oranges, kumquats, mandarinquats, lotus root, satsumas, tamarind, frozen durian, kaffir limes, and mangosteen. Some New Zealand imported yellow lilikoi and an oddball purple one. The yellows were very sweet. Nothing like the typical yellow ones. The outer shape made me think it was another Passiflora species. Some ripe "Fuyu?" Persimmons, Pineapple, Asian white guava, and Meyer lemons. Generic Thai bananas, red bananas, Apple bananas, Green papaya. Burro bananas and some sort of pumpkin or squash. Pepino, Meyer lemon, Mamey sapote, Papayas. Kiwano melons and Key limes. Kiwano has an interesting hint of banana. Precut Jackfruit. I'd totally propagate it if I could keep a tree under 12ft. Fresh Breadfruit. I have only had it frozen and dried chips. The chips are very tasty. Golden Kiwi was nicely ripened. Sapodilla. Overly sweet caramel-ish flavor with pear-like texture. A bit too sweet for me, but still curious to try to buy a grafted tree. Mamoncillo. I tried these in the Bahamas and they were nice. I like them more than lychees, but less than rambutan. Maybe I just haven't had good lychees yet.. The mamoncillo from Jungle Jim's weren't great. Scant flesh and very little flavor. Ick..
From everything I bought, I am germinating 20+ loquat seeds, 10+ mamoncillo seeds, an 1 sapodilla seed. Hopefully nothing was irradiated so the seeds will actually sprout. I will probably trade some of the seedlings and maybe graft some of the loquat seedlings leftover. I will be visiting family in Albany, New York this summer. I will also be visiting parts of Canada just north of NY. Are there any good Asian markets around or in Albany where I might find some interesting fruits to try? Tropical Fruit Discussion / Passion fruit ID? My local international market had some yellow passion fruits. They aren't round like p. edulis flavicarpa, but the flesh is the same color. They weren't super sour like flavicarpa either. just a little tart. Possibly P. edulis "Monte Alegre" or P. alata?. Tropical Fruit Discussion / Is growing Imbe worth my time? I have several seedlings of Imbe (Garcinia livingstonei) which I propagated from seed last autumn. The tallest 3 are about 6-7 inches tall, and it is the most vigorous Garcinia species I've propagated. I decided to grow it seeing that Jay from Columbus successfully fruited his. But it seems that the fruit production and quality haven't been great. Maybe I should keep them? Or possibly trade them off for something better? Would they make a good rootstock? What do you all propose? Here's a photo that was taken in December. Temperate Fruit Discussion / Anyone grow black goji berry? I have a seedling lemon tree that I want to graft onto. It is from a standard grocery store lemon. (Lisbon?) What citrus varieties will take? I am new to how citrus grafting works. Recently had some Mexican cream guavas. They were really good compared to other occasions that I've had them. Creamy texture, sweet and aromatic flesh, suprisingly few seeds, and much bigger than the ones I've had in past years. I have treated them with H202 to prevent mold (and possibly speed up germination). I have them for sale or trade. I'd love to try out some Myrciaria, syzygium, mangoes, caimito, tamarind, Eugenias, maybe even jackfruit (a bit out there, but why not try.). Trees for container culture would be preferred but aren't necessary. Other oddball small fruits are great as well. Ice cream bean- under 1 year from seed, already over 6 ft.
Pitangatuba: started out as a slow grower, but took off after a year. monstera, Passiflora, soncoya, cherimoya, strawberry guava, soursop, blue lilly pilly- < 1 year- already almost 5ft, pomegranate- never fruited but thrives, imbe- fastest of my garcinias- surprisingly fast growers 7+ in even though they are under 5 months from seed, sundrops- very fast for me, blue java banana, achachairu, acerola. Dragon fruit- just sits there/barely grows in winter, Kwai muk, Rollinia (needs more humidity), sugar apple, abiu (needs more humidity), red jabo is struggling but its probably a soil issue. Looking to buy or trade for seeds or plants of Eugenia stipitata/ Araca boi. I want to say they are in season right now in certain areas. Tropical Fruit Discussion / Reliable Thai Ebay Vendors? I'm not a fan of eBay tropical fruit seed sellers. The Thai vendors have some interesting seeds for low prices. I have had two experiences back when I first started this hobby, and they were both poor. Shipping is about 10 days, but many of the vendors do not pack seeds correctly. They'll send the right thing, but it won't be shipped in a medium such as perlite, peat moss, or some other damp sterile material. Not fricken wet paper towels. Many of the seeds sold have short viability, so one must pack them properly. People give them good ratings, but they have no proof of germination when they receive the seeds. Now I primarily buy domestically. I have cuttings of P. quadrangularis aka Giant granadilla for sale. Cuttings are from 3 year old vines. pm for details. Will trade if you have something that interests me. How would you describe the sweetness' effect on foods? Like actual sugar being added or like a sweetener? E.g.- (like aspartame lemon or sugar lemon?) I'm planning on buying a plant this spring and wanted to know. Pinuela is a bromeliad relative of the pineapple. I collected seeds a couple of months ago visiting a friend. The fruits are tart, reminiscent of pineapple, and look a bit like tiny bananas. Foliage is spiny, like that of the pineapple. I only have 12 left from trading them with friends. These are from seeds I bought last year. I was looking through some older photos, and found some from Krohn Conservatory. If you ever plan on visiting Ohio, or live around here, it has a nice Butterfly show in the spring. This gorgeous conservatory has been around since 1933 and has over 3,500 plant species! Of course what caught my attention was the fruiting plants. I wish they had more, but I feel that they'd have to micromanage them more than most of their non-fruiting plants. Krohn has several connected greenhouses, one of each climate: desert, tropical, palm, and orchid. I took some pics of the Satsuma(?) citrus, papayas, and cacao. I have also seen Buddha's hand citrus and pomegranate plants. I just find it to be awesome that any of this is growing nearby me! But I'm sure A LOT of moola has gone into it. I am thinking about visiting and inquiring about it's history and maintenance. Here are some forgotten pics from 2014. I am highly fascinated by the blooms and fruits cauliflorous trees. If you guys have any cauliflorous trees flowering/fruiting rn, post them here. Tell me about your favorites! Ramiflorous trees are acceptable as well. Artocarpus, Jaboticaba, Cacao, Canonball tree, Brownea macrophylla, Davidson's plum, Baccaurea angulate, Ficus pretoriae, Parmentiera edulis, and Maesobotrya barteri. Tropical Fruit Discussion / Is there something wrong with the pm buttons? I was looking at the buy sell trade page and I'll see buyers ask sellers if the got their pm, and they reply that they didn't get it. It's happened to me a couple of times as well. Has this happened to anyone else?